The rooms did not have a fridge or coffee maker, which I was disappointed in. The walls were also very thin. Overall a very nice stay the pool was awesome loved having an Adult Only pool. The food was very good in Primrose and Eataly. I liked the location but did not like that there was no fridge in the room. Location of the hotel was excellent. Room was comfortable. What I did not like was lack of coffee maker or a small fridge in the room that made our trip miserable. The music sound level in the casino was too high (compared to other casinos) some what you would like to run away. We also missed the small affordable food court that existed at the end of the casino when the hotel was called Mont Carlo. The new front food facility serving italian foods only and called ( EATALLY ) seemed a little more expensive and lacked the other variatons. Waiting 45 minutes in line for coffee is ridiculous!! the property was beautiful. the hotel was clean, basically quite for a casino. I did not like the smoke smell in the hall way to the elevators outside the casino. our view was very pretty during the day as well at night. you could see alot of the strip. the amenities was very disappointing. there is no coffee pot, refrigerator or microwave in any of the rooms or hallway. The one Achilles heel of this hotel is the horrific check-in process. Despite showing up promptly right before 3pm, we were directed to use the check in kiosks. There were over 200 people in line for them. After getting to a kiosk 45 minutes later, they fail to read your ID, so then a manager has to come over and enter some info, another 20 minute wait. And then, you are not finished, you only have "checked in", but you have to come back and go thru the process again to actually get a room assignment. All in all we did not get in our room until 5:45.
close to the tMobile arena. clean and not very expensive. great location with many things to do. Amazing Beautiful! Small enough to navigate, not too crowded, easy to grab food at reasonable prices. Eataly is awesome! 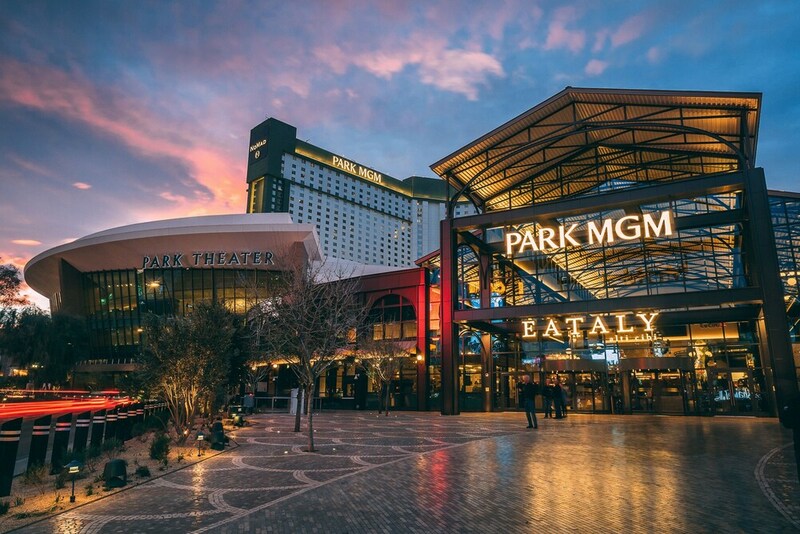 Located in Las Vegas Strip, Park MGM Las Vegas is adjacent to Park Theater and within a 15-minute walk of popular sights like T-Mobile Arena. This 2605-room, 4-star resort has 3 outdoor pools along with a full-service spa and a casino. Enjoy dining at Bavette's Steakhouse &Bar, one of 3 onsite restaurants. Savor a meal from the privacy of your room with room service, or get a pick-me-up at the 2 coffee shops/cafés. For your convenience, a cooked-to-order breakfast is served for a fee each morning from 7 AM to 11 AM. An LCD TV comes with cable channels, and guests can stay connected with WiFi. Pillowtop beds sport Egyptian cotton sheets and the bathroom offers a hair dryer and free toiletries. Other standard amenities include free local calls, a safe, and an ironing board. Park MGM Las Vegas features a full-service spa, 3 outdoor pools, and a casino. Parking is available for USD 15 per day (USD 24 per day for valet parking), and there's also limo/town car service. The front desk has multilingual staff on hand 24/7 to help with concierge services, dry cleaning/laundry, and luggage storage. Other amenities at this spa resort include a 24-hour fitness center, conference space, and a business center. Thank you for your positive review of Park MGM. We hope to serve you again soon. We invite you to experience Best Friend-a culinary evolution of food music and culture created by Roy Choi. Now open! We hope to serve you again soon! Cooked-to-order breakfast is served daily from 7 AM to 11 AM for a fee. Bavette's Steakhouse &Bar - Restaurant and bar open daily for dinner. Primrose - Garden-view restaurant and bar specializing in French cuisine. Open daily for brunch, breakfast, lunch, and dinner. Best Friend by Roy Choi - Restaurant and bar specializing in Korean cuisine. Open daily for dinner. Moneyline Sports Bar Book - Sports bar specializing in American cuisine. Open daily for lunch and dinner. La La Noodle - Restaurant specializing in Asian cuisine. Open daily for dinner. 3 outdoor swimming pools are on site, and the resort also has a 24-hour fitness center. Guests under 18 years old are not allowed in the fitness facility.